I don’t know who thought of making a soft toy monkey from an old sock but I do know it was a fabulous idea that children around the world have enjoyed for generations. 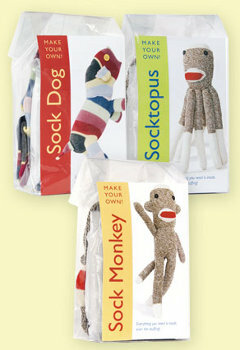 My mother had one and I vividly remember the sock monkey I made in primary school. Sock monkeys are famous for the sock having a red heel but nowadays you can find just about any colour under the sun and some not-so-traditional ‘monkeys’. 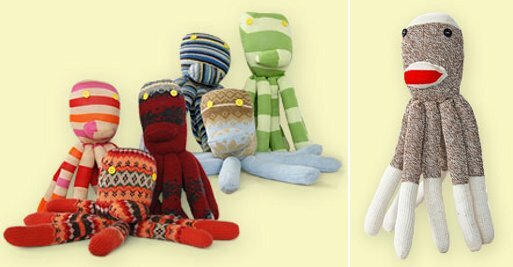 The Socktopus is one such creation – as Friends of Socktopus say, it’s the “long lost cousin of the famous sock monkey”. Everything about the Socktopus is traditional, except its eight legs of course! Made from red heeled socks with button eyes, the Socktopus is the perfect companion for the kid who appreciates slightly quirky toys and the parent who feels the same. Friends of Socktopus also make a Socktopus from recycled sweaters (I’m digging these) and traditional sock monkeys with an edgy punk rock twist – not for the faint hearted. Handmade in the US with love, head to Friends of Socktopus to buy, with prices ranging from US$25 to US$30. Email for a shipping quote to Australia.